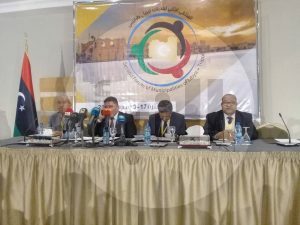 In the final communique at the end of their two-day meeting in Tripoli, Municipality and Local Council leaders today called on the Judicial High Council of Libya to take over the running of the country – if the House of Representatives and the High State Council fail to reach agreement. There were 107 local leaders at the Tripoli meeting, with over 30 crossing the political divide and arriving from eastern Libya – despite fears of intimidation back home. The turnout of eastern-based local leaders was even more surprising for some analysts – in view of the fact that many in the east are military appointees. However, it was seen as a reciprocal move for the many western-based leaders who had attended the January Municipality meeting held in the eastern city of Shahat. In their four-point communique, the local leaders called for the unity of Libya and the non-intervention of foreign forces – especially in the south of the country. Secondly, they formed a committee that would – with UN supervision – oversee the direct talks between the House of Representatives and High State Council Dialogue Committees. The aim of these committees was to agree on the Libyan Political Agreement amendments, as per the UN Action Plan, that would lead to the formation of a unified government and unified state institutions. If these committees that have so far been unable to reach agreement – continue to fail to find a political compromise within 30 days, the local leaders called on the Judicial High Council to form a caretaker government for no more than 1 year. This would supervise the constitutional referendum and elections to take Libya out of its current ‘‘transitional state’’. 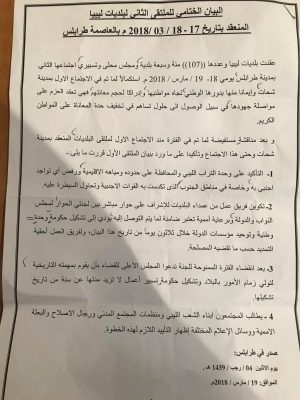 The Municipality meeting in Tripoli called for the Judicial High Council to take over the running of the country if the HoR and HSC fail to agree within 30 days (Photo: social media).